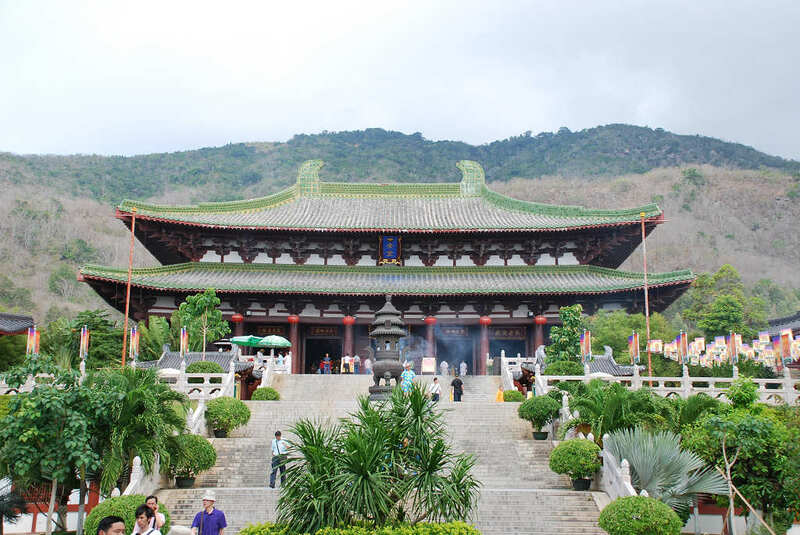 Nanshan Temple (Chinese: 南山寺; pinyin: Nánshānsì; literally: “South mountain temple”) is a Buddhist temple located in Sanya, Hainan province, China. 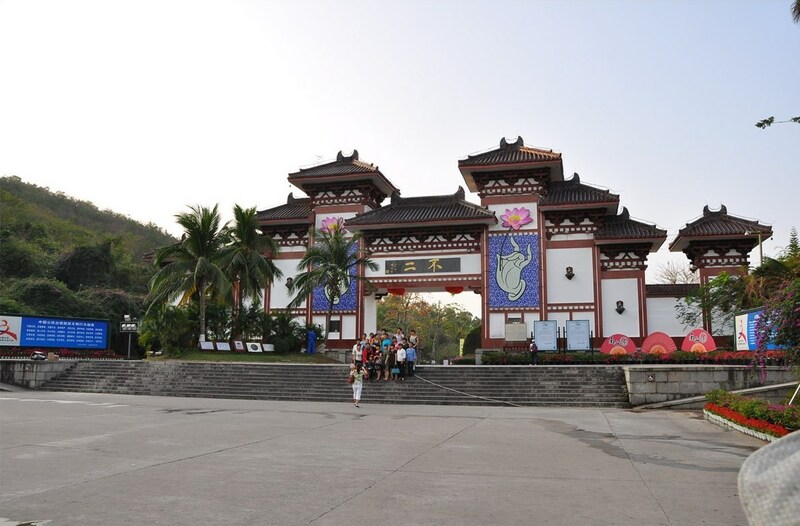 It is one of the largest cultural tourist attractions of its kind in China, the colorful Nanshan Cultural Excursion Zone, located just 40 km west of Sanya City along the Hainan West-line Expressway is, 1.5 hours from Downtown Sanya, 40 minutes from Sanya Airport, and only 15 minutes from Yazhou Ancient Town. Luhuitou is a peninsula with water on three sides. 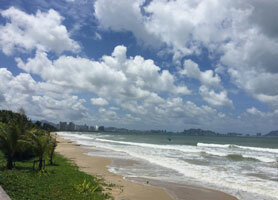 It sits in Sanya Bay, which is five kilometers from the city. 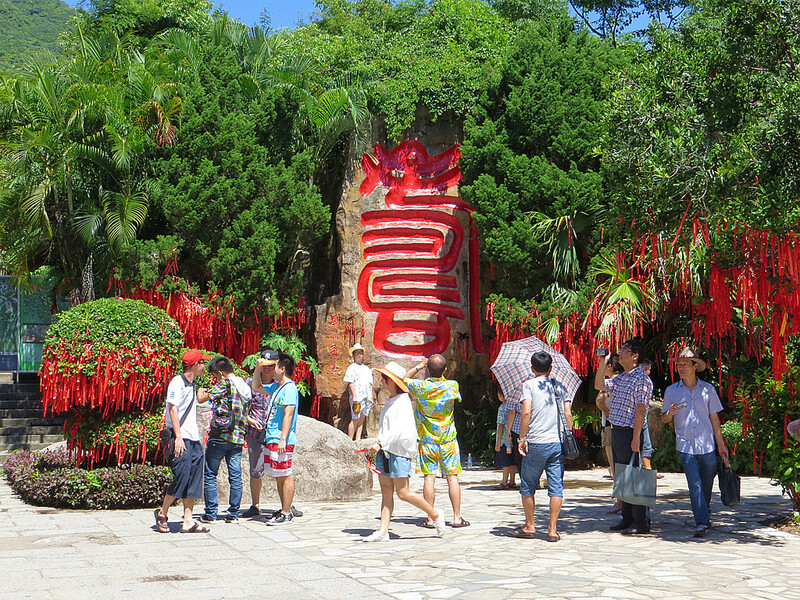 Luohuitou Park is situated on a hill of Luhuitou Peninsula near the seashore, three kilometers away from Sanya city in the south. It is 30 munites driving from Sanya Airport, 20 minutes from Yalong Bay and 30 minutes from Haitang Bay. The temple’s name originates from a popular Buddhist expression. (Chinese: 福如东海, 寿比南山; literally: “Good fortune is much as the East Sea; longevity is high as Nanshan”). 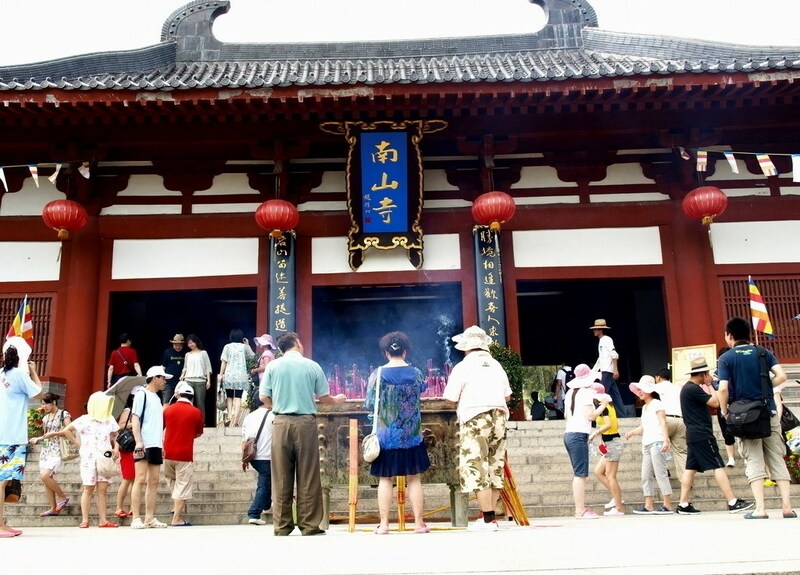 Nanshan Buddhism Culture Park & Nanhai Guanyin Buddha is a window on China’s traditional Buddhism culture; the Felicity and Longevity Culture Park shines its light on an atmosphere of peace and harmony, and the Nanhai Cultural Customs Park highlights China’s diverse social customs. 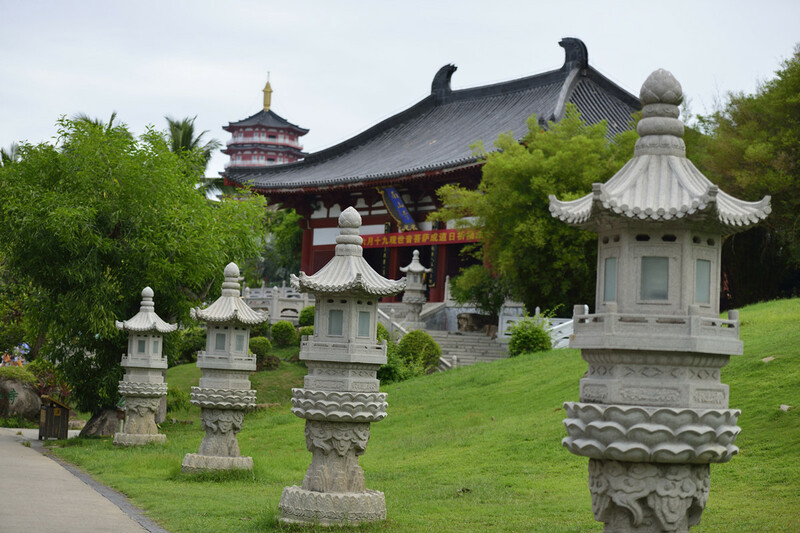 Key features of the zone include the three-sided statue of Buddha, Buddhist temples, superior landscaping, and sea views. The new highlight is the Nanhai Guanyin Buddha on the sea (108 meters in height). 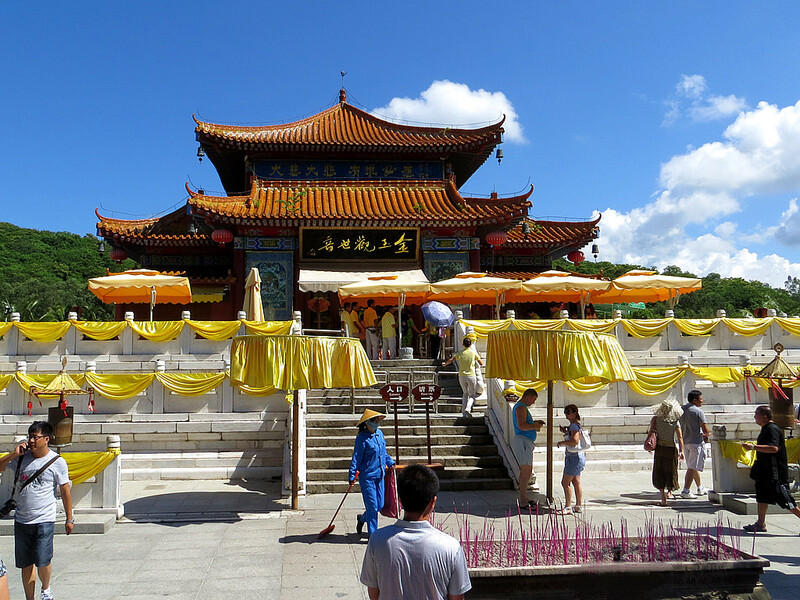 HISTORY: The temple was built on April 12, 1988, to commemorate two thousand years of Buddhism in China. It has a total area of 40,000 square meters. It contains several Tang dynasty replicas. 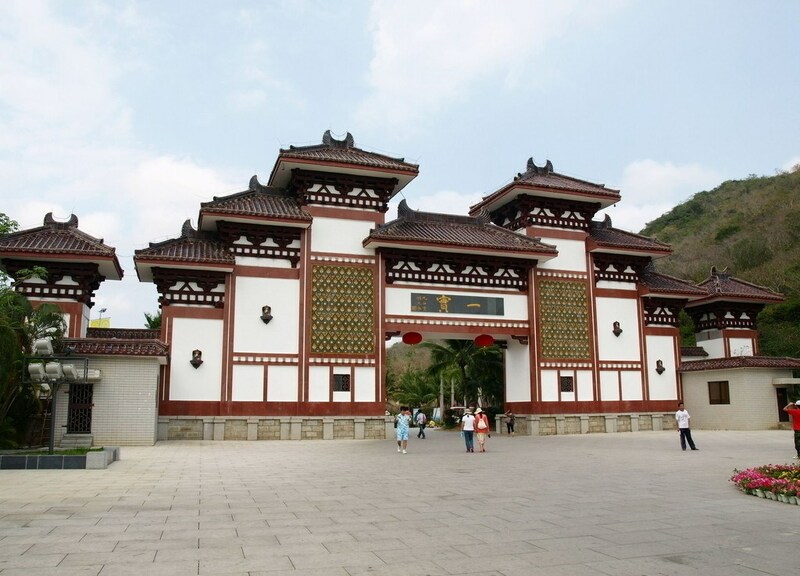 The temple is part of an area known as the Nanshan Buddhism Cultural Zone, classified as a AAAAA scenic area by the China National Tourism Administration. The zone also consists of the Guan Yin of the South Sea of Sanya statue. GEOGRAPHY: It is located just 40 kilometers west of Sanya City along the Hainan West Expressway. It is a window on China’s traditional Buddhism culture. SUMMARY: The Nanshan Cultural Park highlights China’s diverse social customs. The key feature of the zone is the three-sided statue of Guan Yin Buddha（海上观音 Haǐ shàng guān yīn）, Buddhist Temples, spectacular landscape and sea views. The zone has been designated a Priority Project of China Tourism Development and earmarked for further development. 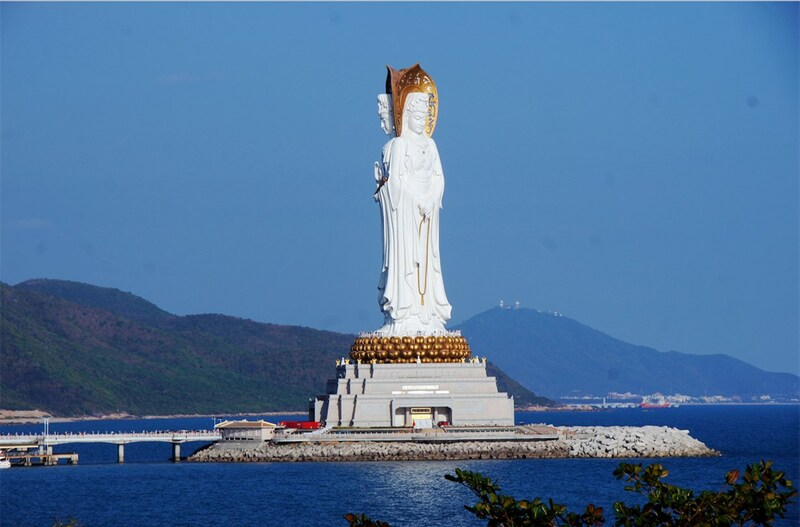 Recently completed, the bronze statue of Guan Yin Buddha stands 108 meters tall on a man made island in the sea just off Nanshan. It is larger than the statue of liberty. Nanshan, with its harmony and beauty, is now a tourist destination attracting more and more tourists coming from all over the world. It is here that people can enjoy themselves not only in the great tropical ecological environment with sunshine, sea, sand, blossom and greenery but also can feel with heart deep within the real beauty of peace and harmony of Buddhism culture and terse the joyfulness of returning to the nature. The Nanhai Guanine Buddha on the sea is the highest on the ocean which you could see from airport when you land Sanya. The beautiful gardens layout and many cherished tropical plants. You could visit by public transportation which costs CNY20/person/way from hotels on Yalong Bay, CNY15/person from hotels on Dadonghai Beach, CNY10/person from hotels in downtown Sanya and CNY7/person from hotels on Sanya Bay. The bus runs from 7am till 6pm every 20 minutes a bus. Bus Number is 16, 25, 24 & 15. 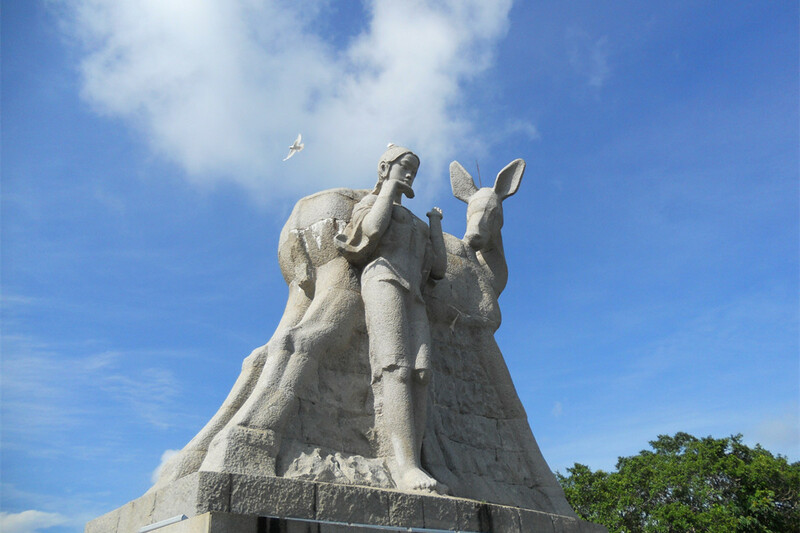 Deer Park (Luhuitou Park) is both a daytime and nighttime destination, offering spectacular views, shopping and dining facilities. A charming park was built on top of Luhuitou and a huge sculpture 9 meters long, 4.9 meters wide and 12 meters high was set there in accordance with the moving legend. The city has also been nicknamed “Deer City”. The panoramic view of the vast sea, the rolling mountains and Sanya city from the top of the hill is fantastic. Inside Luhuitou Park are winding paths, a Halley’s comet observation station built on the mountain, a white wave-hearing pavilion, a red Guanghai kiosk, Lover’s Island and other scenic spots such as Monkey Mountain, Deer House, the Hut of the Li People, Turtle’s Heaven and the Immortal Pond. What’s more exciting is that you can taste red coconut, the treasure of Hainan coconuts. Luhuitou Bay is at the foot of Luhuitou Mountain, where you can enjoy and view schools of colorful parrotfish, unique sea cucumber, fish worms, sea sycas, sea fans, coral trees, sea flowers, soft coral, sea oysters, jellyfish, sea nettle and so on. Now the Luhuitou Hill is entitled as the park of love and ecology. The main scenic spots include the Sea-View Platform DeerYardsmooth approachFortune Comes from the EastLove Garden Li Ethnic SINGING AND DANCING PERFORMANCE Luhuitou Sculpture hilltop Garden. The luhuitou Park is also the center of vege-tation preservation zone of Sanya and haswell-protected tropical forest and natural ecology with many precious species. Luhuitou Peninsula is not only a romantic peninsula, but also a lush, natural environment covered with deciduous trees and plants. It is the ideal place to spend a winter holiday in China. Entrance fee to Nanshan Park & Luhuitou. Private transfers with Chinese speaking driver, and Tram in Nanshan Park & Luhuitou. An English tour guide costs CNY800/day. We request min. 4 pax/trip. It costs CNY1098 for 2 persons, and CNY1380 for 3 persons. Question: When do we start from our hotel and how long does this tour last? Answer: It is a private tour, so you decide what time to start. Normally we recommend 9-10am. Answer: Pick up & drop off is always from your hotel in Sanya or cruise terminal by private car or van. Question: How long does the tour last? Answer: It will take around 8-9 hours. The price is for 4 passengers/trip. If only 2-3 passengers in your group, please book for 4, then we will adjust by email.